Last week, on January 23, we published a piece about a Michigan-based Islamist charity named LIFE for Relief and Development. In our article, we detailed LIFE's involvement with overseas terrorist groups, and its staffers' history of organizational mismanagement. Even beyond these incriminating factors, the simple bigotry of LIFE's leadership shows that the group is not worthy of its charitable status. As we recently discovered, LIFE's current chief executive, Dr. Hany Saqr has long been in the habit of sharing wild, explicitly anti-Semitic posts on his Facebook page. One of the most extreme posts—from August 2013—features a video of an Islamist rally in Jerusalem. Saqr's shared post includes a caption for the video: "Al-Quds supports the leader Muhammad Morsi and there is no consolation for Sisi, the dog of the Jews." Saqr, incidentally, promotes the Muslim Brotherhood elsewhere on his page; he uses the four-fingered Muslim Brotherhood symbol as his profile photo. 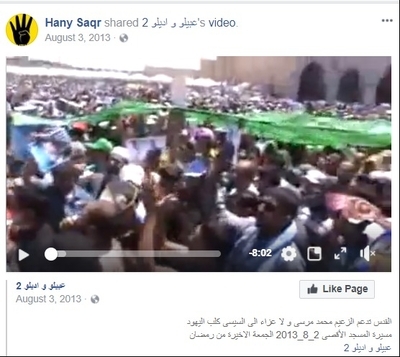 Another shared rant castigates the post-Sisi Egyptian military for killing more Egyptian citizens at the Rabaa Protest massacre than Jews in Egypt's whole history. Saqr's shared post reads, "The Egyptian army killed 750 Jews in six days in the age of the 1967 war. The Egyptian army killed 1000 Jews in 6 years in the age of the War of Attrition. The Egyptian army killed 2500 Jews in one year in the age of the war of 1973. The Egyptian army has killed more than 5,000 Egyptian Muslims in a month since the coup began. More than 3,000 were killed and most of them burned during 'a few hours' in Rabaa Square." And a third shared post is a short allegorical story in which Saqr claims "the Jew" gets what he wants by "crying," falsely claiming ownership of property and then taking others' money. Though we are certain this only scratches the surface of Saqr's anti-Semitism, these posts alone should be enough to discredit LIFE as a "charitable" organization.